With babies come stains. I've had more than one Stepford Wives conversation where friends discuss the BEST pre-treater they've found. In a rare bout of silence, I tend to keep my mouth shut. Pre-treaters just don't seem that effective to me, at least not compared to a cheap bar of Dial gold. A little warm water, a quick rub of a Dial bar, and some hand scrubbing can remove a remarkable assortment of fresh stains. One bar lasts for months, costs under $1, looks perfectly normal in the shower, and easily packs for travel (in carry-on even). It also carves into swell little boats in a pinch. I have friends who swear by Fels-Naptha (also made by Dial), but I'm just too lazy to go to the one grocery store that carries it. 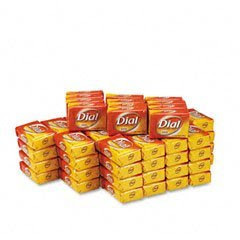 You can stock up on Dial at Amazon, but unless you own a bathhouse or do laundry for the whole Little League it's probably easiest to find a sale on the 3 bar pack closer to home. Baby Toolkit has no professional expertise in soap, are only gifted amatuers in the field of staining, and have no extra-consumer connections with Dial or its parent companies. The only free Dial we've ever recieved have been hotel soaps (which probably aren't really free). "gifted amatuers in the field of staining" - I'll have to put that on my resume. I have never tried dial soap as a pre-treater. I will certainly pick up a bar or two. I'd like to test it before my current bottle of spray runs out! Our family is about ready to hit the pro circuit in the field of staining though.